I can't tell you how much I love this picture. Whenever someone tells me that they don't like getting all sweaty, I think of this. Most people realize that no one really looks their best in the gym. But, a lot of people don't realize that looking really good outside the gym requires enough hard work that you can look really sweaty and worn out in the gym. Now, let's realize that the idea of looking really good means very different things for different people. 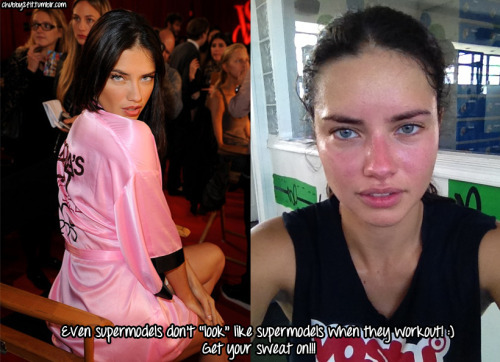 For a supermodel, it means looking like the woman on the left. For a guy in his mid-thirties like me, it's a bit different. For a woman who wants to keep up with her growing grandchildren, it is something entirely different. But, still, there is a direct correlation between looking like the girl does on the right to looking as good as she does on the left. There's a similar pair of photos for each of us, even if we have drastically different goals. 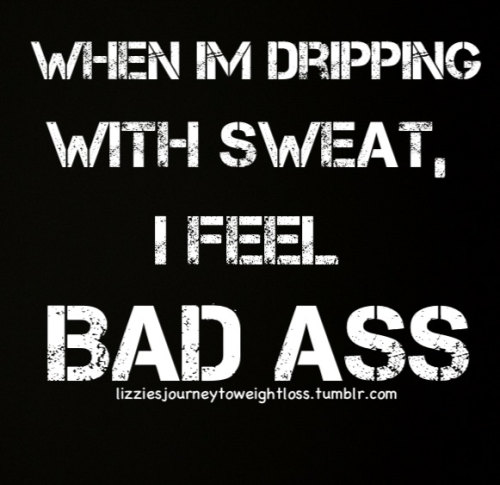 Obviously, it's okay to be a little sweaty. Heck, it's okay to be more than just a little sweaty. It's also okay to be a little smelly thanks to all that sweat. Please do wash those clothes between workouts, though. Yes, we can tell the difference between yesterday's sweat that's had time to brew and today's sweat -- believe me. It's okay for some of that sweat to be left behind after you use some equipment -- just please do wipe it away once you are done. When it comes to sweat, gym floors are open season. We try to keep non-workout areas like the front desk fairly clean but otherwise, drip away. It's okay to let out a little grunt here and there. It's also okay to breathe heavier than the people around you. You are there to work. It's a gym, not a library. It's okay for your hair to get a little frazzled and your clothes to get a bit ruffled. It's okay to not be entirely sure how to use a piece of equipment - as long as you aren't a danger to yourself or others, that is. It's okay to forget what you were doing or what you were going to do next. That's actually a sign of an experienced exerciser. Sometimes we get lost in our workouts and forget what we were going to do next. It's okay to not finish the set you wanted or not finish a program on a treadmill. The person next to you won't even notice you did 9 instead of 10 or that you didn't finish that last interval in the treadmill's "hill" program. Remember when I told you it was okay to fail? It's okay to be a little dejected when a workout doesn't go as well as you'd like. No one likes seeing someone a little down, but don't feel like you have to hide it. It's okay to not look and act like you have all of the energy in the world. We can't all be Richard Simmons. Down here in the real world, we aren't all energetic and perky. Actually, that's a little annoying. You need to come to the realization that you are going to be sweaty. You are going to tire out a bit and not be as energetic. Your hair is going to get a little messed up and your clothes won't be as professional as they are in the office. And that's okay!! The next time you are in the gym, take a look around. If you're in a gym like mine, you'll see people of all ages, shapes, and sizes. They are all working at different paces and coming from different places. But, in the end, you're all there to look and feel a bit better. And you all know that you're not putting your best foot forward there. Who cares how you look inside the gym, you are training to look good outside the gym.